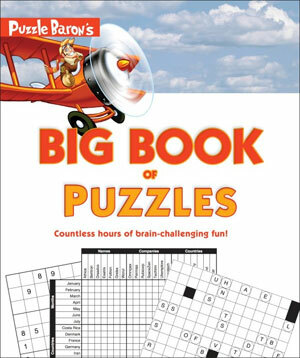 Our first compendium book, Puzzle Baron’s Big Book of Puzzles has just been published! It includes four hundred of our most popular puzzles, including logic puzzles, crosswords, cryptograms, acrostics, drop quotes, word searches, sudoku, clueless crosswords and many more. We had a great time putting this book together, and we hope you enjoy solving these puzzles just as much as we enjoyed making them!